Who doesn't love bright and bold colors in the summer? 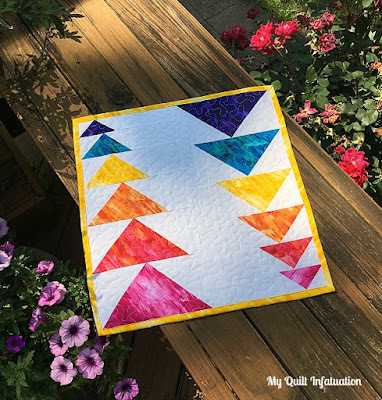 Today Kelly from My Quilt Infatuation is sharing a tutorial for a modern flying geese mini using a gorgeously textured and cheerful palette from the Patio Splash collection. Check out her tutorial and then head over to her blog to enter for a chance to win a bundle of Patio Splash. Happy almost summer, friends! I'm Kelly, and my blog home is My Quilt Infatuation. I'm super excited to share the tutorial for this little mini, featuring a few fabrics from the Patio Splash collection. I chose to use the Color Strokes prints from this collection, and I am in love with the fresh, summery palette. 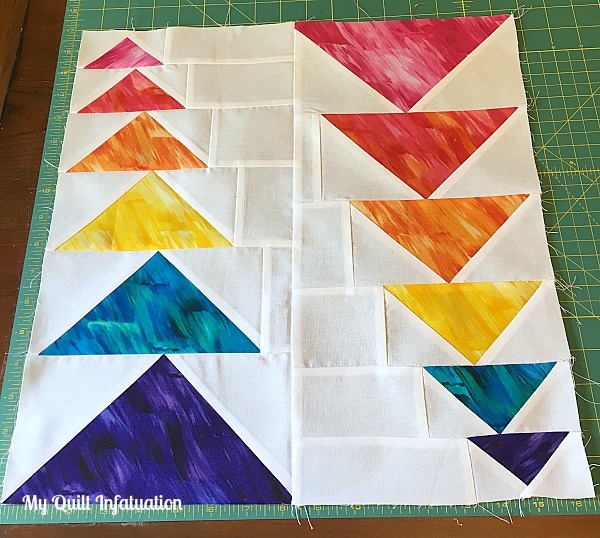 This mini is a fun twist on the timeless flying geese block. My making geese of several sizes, it creates the fun illusion of sliding right down the quilt. 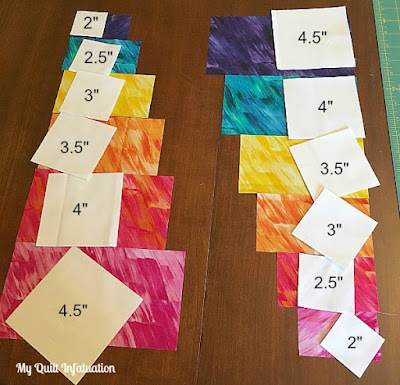 This mini requires cutting your fabrics into several different sizes, and I've tried to make this part as organized as possible so it doesn't get too tedious. When working with so many different sizes, I find it easiest to lay everything out for your flying geese units before sewing anything at all. Arrange them in increasing size order on the left, and decreasing size order on the right. Then, to keep everything organized, go ahead and lay two white squares of the corresponding size on each rectangle. 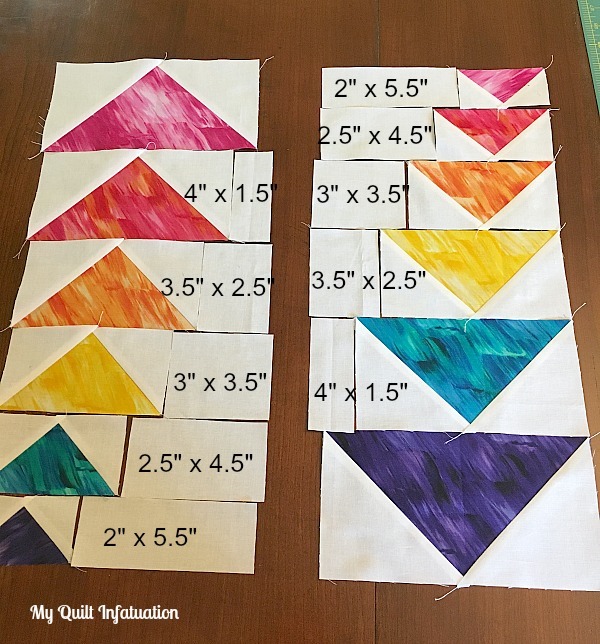 These squares will be the corner units needed to create the flying geese units. 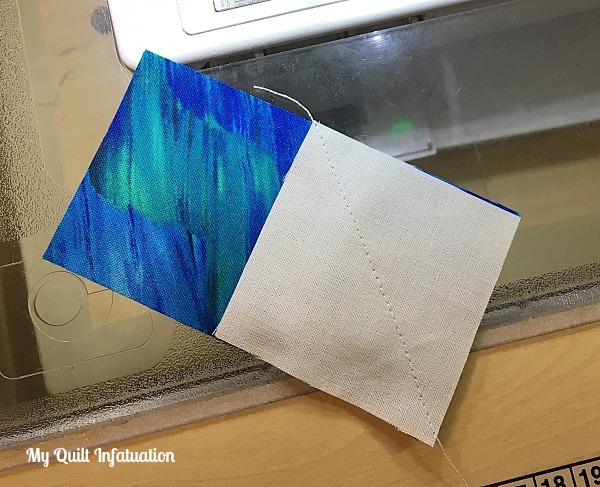 To sew the flying geese, we'll use the stitch and flip method. When making several geese the same size, there are more efficient ways to make more geese at one time, but that doesn't really help when you only need a single unit of each size/color. 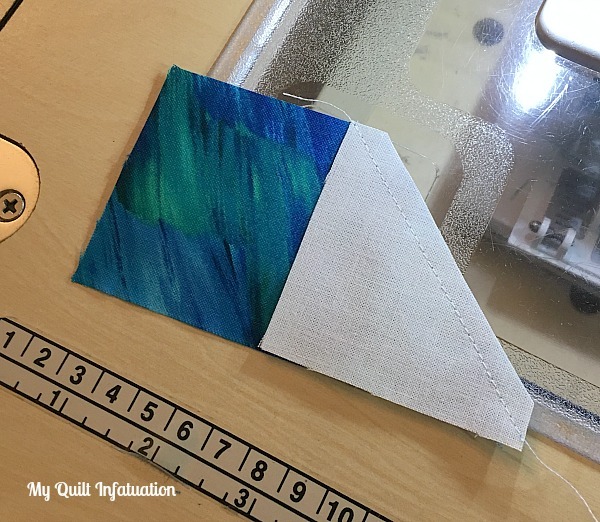 To make a single geese unit, align the white square with the edge of the print rectangle, and sew from corner to corner. To help you sew a straight line, you can either draw a line on the wrong side of your square, or you can use painter's tape. Keep the corners of your square aligned with the edges of the painter's tape, and you'll have no trouble keeping a straight seam. Since there are only 12 total flying geese, it is pretty quick to sew the first square to each one, before heading to the ironing board. Then, just take your scissors and trim each corner to 1/4" seam allowance. Don't worry! This doesn't have to be perfect. Just be sure you don't cut too close to the seam. Then press each corner open! Then, just repeat this process on the opposite side of each flying geese unit, using the second white square. When they're all pressed open, lay them back out in order by size, and use your white rectangles to fill in the gaps, making each flying geese unit the length of the longest one. Pay close attention to the direction of the flying geese. I've chosen to have one row pointing upward, and the other down, but you can mix them up if you would rather. 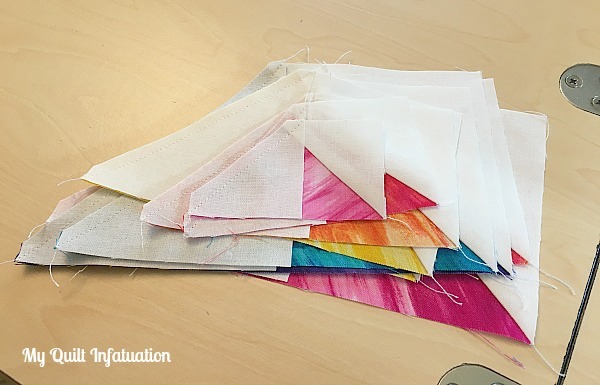 Sew each unit to its corresponding strip, and then sew the flying geese strips together to make your mini. 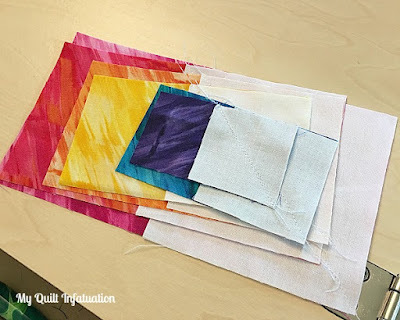 Finish it up by quilting it however you like. 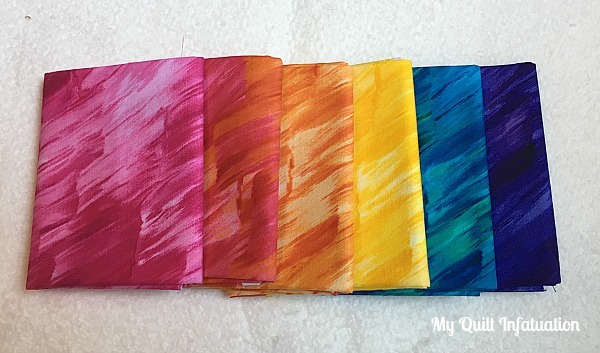 This finished mini measures 16" x 16 1/2" and the bright happy colors would be a cute addition to your favorite summer decor, either inside, or (dare I say it?) your patio! I'm so excited that I have the opportunity to offer a fun giveaway! Benartex is graciously offering a bundle of the Patio Splash fabrics I used to a a lucky reader. Head HERE to my blog home to enter. Happy summer and happy sewing, y'all! Head over to Kelly's blog to enter the giveaway! Click here to see the entire Patio Splash collection. 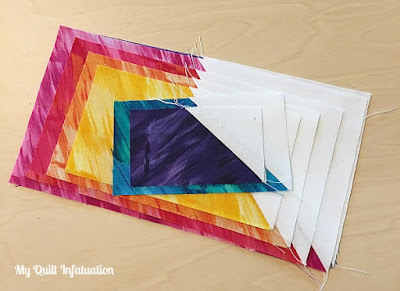 Fabulous design...love how clear the tutorial makes the process! I lov love the simple movement in your mini... and the pretty colours too!! Kelly's mini is gorgeous and I really love these fabrics. Thank you for the great Blog Hop and for all the giveaways. This is so neat!! Thanks for sharing!